The 45-year-old had pleaded not guilty to murdering the father of one. DUBLINER DAVE MAHON has been found guilty of killing his stepson, Dean Fitzpatrick, the older brother of missing teenager Amy Fitzpatrick. The 45-year-old was cleared of murdering the father of one with whom he did not get along on 26 May 2013. He had pleaded not guilty. The 23-year-old received a stab wound to the abdomen outside the apartment that his mother, Audrey Fitzpatrick, shared with Mr Mahon at Burnell Square, Northern Cross. The State argued that the 45-year-old accused was drunk, angry and agitated when he thrust a knife into his stepson with deadly intent. Mahon claimed his death was an accident or possible suicide and that Mr Fitzpatrick had ‘walked into the knife’ while they had been arguing. The trial heard that Mahon had been in a relationship with Audrey Fitzpatrick for 12 years by the time her son died. The couple had moved to Spain’s Costa del Sol with her children, Dean and Amy, in 2004. Mr Mahon worked as an estate agent. He told gardaí that they were millionaires, with eight or nine houses and bars, but that they had spent it all looking for Amy. The teenager went missing without trace on New Year’s night 2008 as she walked home from a friend’s house along an unlit dirt track. Despite extensive searches, she has never been found. The deceased was 17 when his sister vanished. He moved home to Dublin soon after turning 18 and lived with his father, Christopher Fitzpatrick. He met his partner, Sarah O’Rourke, in 2010. They had a son together and lived in Lusk in the north of the county. Mahon and Audrey Fitzpatrick returned to Ireland more recently and the court heard that they have married since Mr Fitzpatrick was killed. The trial heard that the deceased had psychological issues, had begun misusing drugs at the age of 11 and had self harmed. Ms O’Rourke gave evidence that he used to take ‘relaxers’. She also testified that she had asked him to move out just days before he died, because he was selling tablets. She saw him with a black eye the morning of the fatal row; he said he had owed someone money. A quarter of an hour before the fatal row, she sent him a text saying she was with someone else ‘to hurt him’. His father gave evidence that he was troubled during the last week of his life. “There was stuff going on with his girlfriend,” he said, adding that, as far as he was aware, the deceased couldn’t see his child. “Also, his sister was missing,” he explained. The accused told gardaí that he and Mr Fitzpatrick had ‘an up and down’ relationship. However they had joined a gym together and both attended separately the day before the row. The deceased saw his stepfather’s bicycle parked outside and took the plastic water bottle off it to annoy him. It worked. Staff in the gym said there was nothing they could do unless he reported it to gardaí but he said he wouldn’t do that over a water bottle. He decided instead to contact his stepson. He spent much of the next day drinking and phoning Mr Fitzpatrick. Records showed several unanswered calls. Ms O’Rourke said that Mahon threatened to stab her in the neck if she didn’t get her partner to call him back. He eventually convinced him to come to his apartment. CCTV showed him enter the building at 11.06pm and Mahon leave seven minutes later. It’s not known if the deceased noticed the photographs of his sister and Mahon’s late mother strewn on the floor. Other family photographs and certs Amy had given the couple were found behind the building. Mahon said that his stepson had pulled a knife on him in the apartment and that he had wrestled it from him and put it into his pocket. He said the deceased had left but that he followed him out and took the knife out to show it to him. He said Mr Fitzpatrick had walked into it. There were two of Mahon’s friends in the flat at the time: Karl O’Toole and John McCormack. 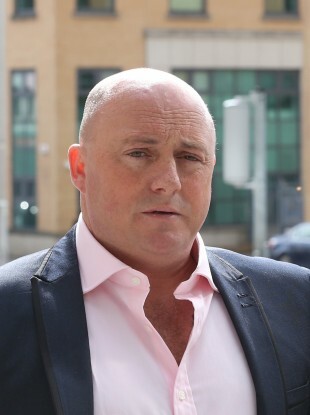 Mr O’Toole did not see any knife until Mahon returned after the stabbing. He said he didn’t really know what had happened but Mahon had asked him to get him out of there. So he drove him around the back roads of Dublin for a number of hours before eventually bringing him to Mahon’s father’s house. Mr McCormack left the flat with the deceased but did not give evidence and the judge told the jury not to speculate about that. The trial heard that Mr Fitzpatrick had run downstairs, but collapsed outside and bled to death internally. The knife had damaged a number of organs as well as the aorta. The prosecution pointed to a number of threats Mahon had made to stab his stepson. The defence said these weren’t serious and perhaps part of a particular vernacular. His barrister, Sean Guerin SC, referred to the pathologist’s view that it was possible that Mr Fitzpatrick had walked onto the knife. He also said suicide had to be considered, pointing to what had been going on in Mr Fitzpatrick’s life and the unknown effects that medications found in his system might have had. Mr Guerin also suggested the possibility that Mr Fitzpatrick had seen the knife, but had failed to appreciate the danger. He reminded the jury that he had mentioned to medical personnel that he felt like Superman when he drank. Ms Justice Margaret Heneghan told the jury of six women and six men that three possible verdicts would be open to them: guilty, not guilty of murder but guilty of manslaughter, or not guilty. Following eight hours and 16 minutes of deliberation over three days, the jury returned Friday afternoon with a majority verdict of 10 to two. The foreman’s hand was shaking as he handed the issue paper to the registrar. It was less than 20 minutes after they had been given the option to reach a majority verdict. Mr Guerin applied for bail for his client, pointing out that he had lived in Spain after the incident, but had returned home to be charged. The State objected and the judge remanded him in custody for sentencing on 30 May. Email “Dave Mahon found not guilty of murder but guilty of manslaughter of his stepson ”. Feedback on “Dave Mahon found not guilty of murder but guilty of manslaughter of his stepson ”.